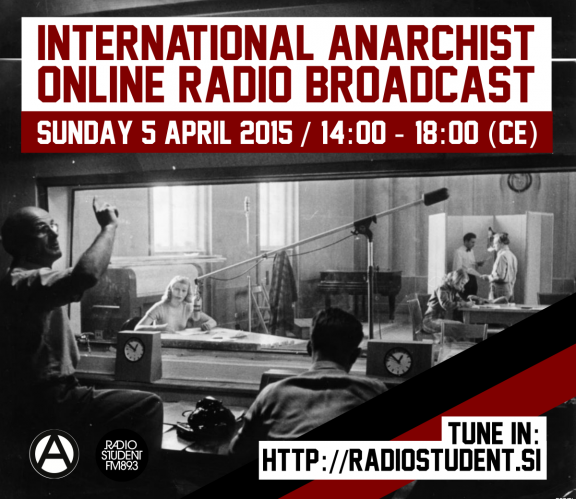 On Sunday, the 5th of April 2015, the participants of the International Gathering of Anarchist Radios that is taking place in Ljubljana, Slovenia (2-5 April), will do a 4 hour live radio broadcast that can be listen to through an online stream. The broadcast will be done from Ljubljana based independent Radio Student. You can tune in and listen to the broadcast through direct link to the live stream. There will be a range of topics covered during the broadcast. The participants from Slovenia, Serbia, Greece, Austria, Italy, Germany and France will present their radio projects, the gathering itself and the activities of the anarchist, antiauthoritarian and wider social movements on the local level. They will talk about current issues such as the hunger strike in prisons and a struggle against the state and capital in Greece, police raids on social centers and repression in Spain, experiences with the Blockupy protests and mobilization against the G7 meeting in Germany etc. They will announce some of the future events of the international anarchist movement: bookfairs, protests, workshops and meetings. During the broadcast also people from other parts of Europe and the Americas that couldn’t attend the meeting itself will join us through the radio frequencies to share their ideas, proposals and informations. The broadcast is still in the preparation (mainly it will be prepared during the gathering) but you can expect interesting discussions and a lot of first-hand informations. Help us spread the information about the online radio broadcast that will be done this Sunday. Please share this informations with your comrades and all those interested through your channels of communication! The process is open, so feel free to join us!